Boys will always be boys but the 21st century bad boy has changed his looks! Building on this new zeitgeist of clean cut modern machismo, designer Jarrod Glaze brought British racecars, mountain men and American athleticism together and packaged them into one burly, testosterone driven display of menswear. 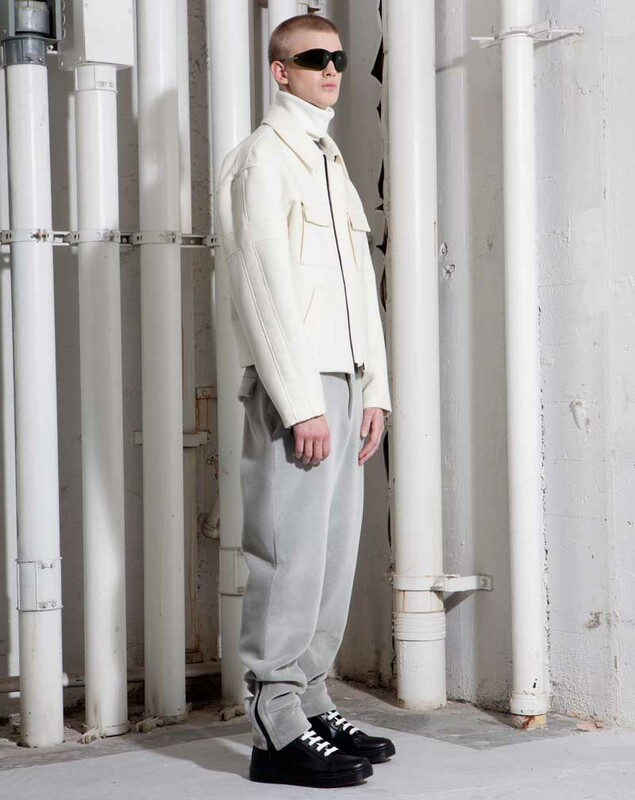 Titled “Highboys in the Lowlands”, the Glaze Fall/Winter 104-14 collection focuses on modern machismo. “Teddy Boys” in oversized coats and loosely tapered trousers inspired the silhouette which pair well with the Dr. Martens provided footwear shown throughout the collection. The oxford shirt is keenly updated as it is morphed into an all-in-one button down/sports jersey. Bomber jackets and knee-length overcoats define the outerwear in textural shades of green and grey with a variety of fur collars. British racing green takes the lead as the key color shown in leather, fur, wool, and moleskin. Technical fabrics such as silver faux, bonded “seal skin” contribute to the modernity of the classic silhouettes.